Background photo by Simon Mer. As a symbolic representation of present-day Canada, the beaver predates the maple leaf by a few hundred years. In 1621, it first appeared on the coat of arms of Sir William Alexander, who was granted title to land now known as Nova Scotia. In 1678, Governor Louis de Buade de Frontenac included a beaver in his proposed coat of arms of the city of Quebec, but the design wasn’t endorsed. Ultimately, the beaver’s first official use as an emblem of New France came in 1690 with the creation of the Kebeca Liberata medal, which celebrated Frontenac’s victory in the Battle of Quebec. Designed by Dominion Sculptor Cléophas Soucy, the shield-supporting beaver sculpture was carved out of sandstone in the fall of 1938, more than 10 years after the initial inauguration of the Peace Tower — but not before generating some controversy. In January 1938, newspapers unveiled an original concept that featured a mother beaver with nine kits — one for each province (Newfoundland became the 10th province in 1949). However, many took issue with the scientifically inaccurate litter size, and in March, the prime minister proposed a single beaver instead. On the 12th September 1938, Soucy’s revised design of a metre-high, shield-supporting beaver was approved and the work was completed within just one month. It is noteworthy to highlight that the beaver’s historic importance led to its official recognition as “a symbol of the sovereignty of Canada” in 1975. The coin is struck on a 10-ounce pure silver planchet measuring an impressive 76.24 millimetres in diameter and is designed by artist Patrick Bélanger. 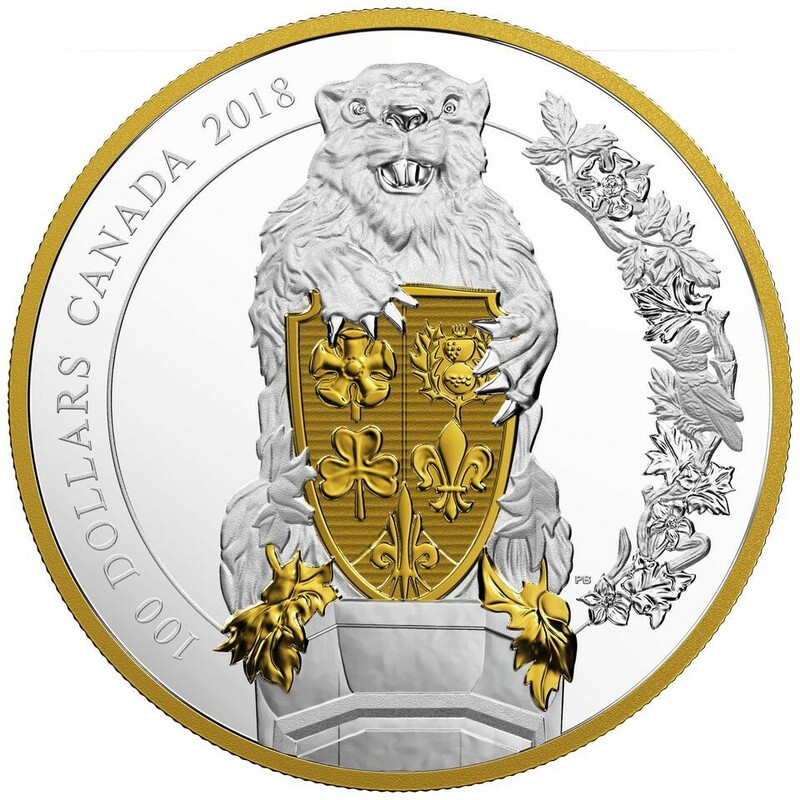 The reverse of the coin’s design includes a rare close-up of the beaver sculpture that stands atop the ceremonial entrance on Parliament Hill in Ottawa. The deliberate positioning of the beaver helps convey the height of one metre of the actual stone sentinel, while a frontal view emphasises the facial features and textural details. 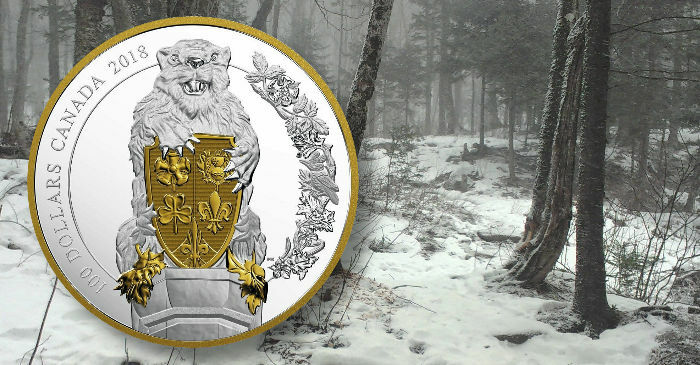 The industrious animal emblem of Canada grips an unusual shield bearing the floral emblems of five European cultures that figure prominently in Canadian history: the English Tudor rose, the Scottish thistle, the Irish shamrock, the French fleur-de-lis, and the Welsh leek. Selective gold-plating highlights the heraldic element and a scattering of maple leaves. To the right of the sculpture is an ornamental flourish, and the floral motif is based on a frieze that also adorns the Centre Block’s grand entrance. On the left side of the primary design is the face value, 100 DOLLARS, and the words CANADA 2018. 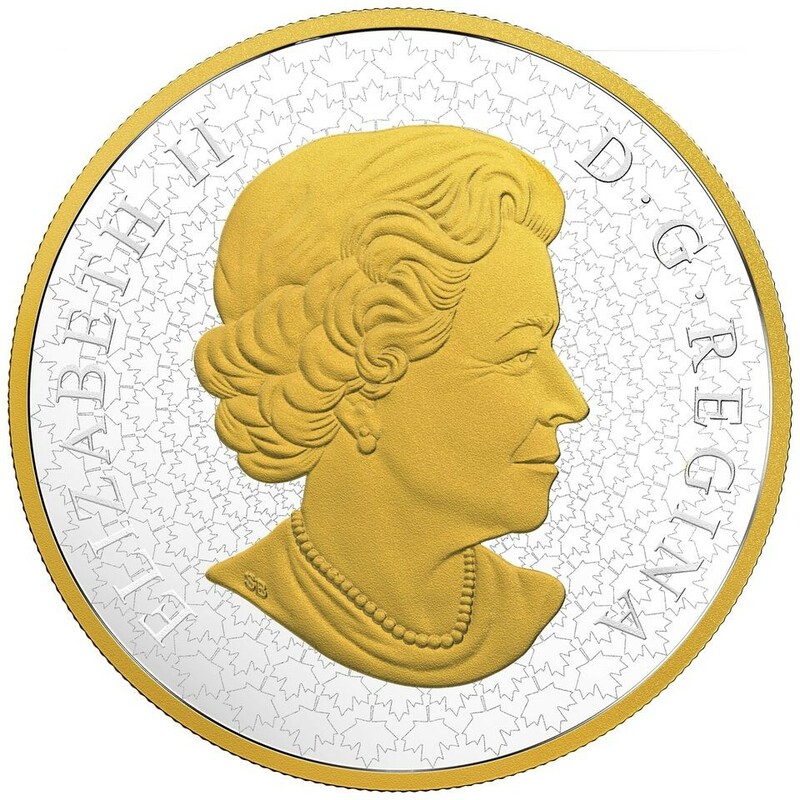 The obverse features the effigy of Her Majesty Queen Elizabeth II created by Susanna Blunt and has been seen on all Canadian circulation and many commemorative coins since 2003. The Queen’s likeness is also selectively gold-plated to enhance the overall design. 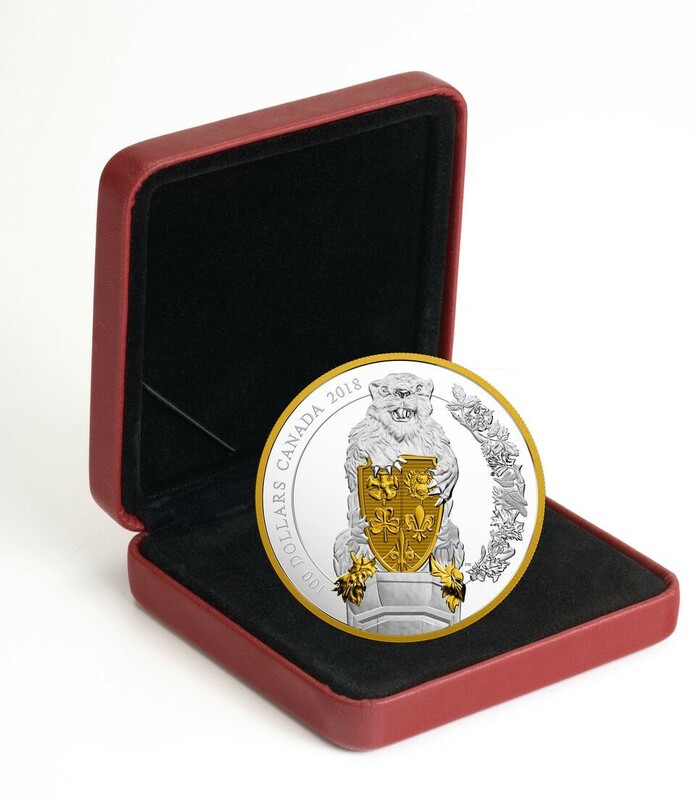 The coin is specially encapsulated to accommodate its extra-large diameter and is presented in a custom-made, branded case which also includes a certificate of authenticity. The first coin in the series was released in June, and the other two coins will be: The Soldier (available October 2018), and The Lion (available December 2018). For additional information on these and other coins available from the Royal Canadian Mint, please visit their website.